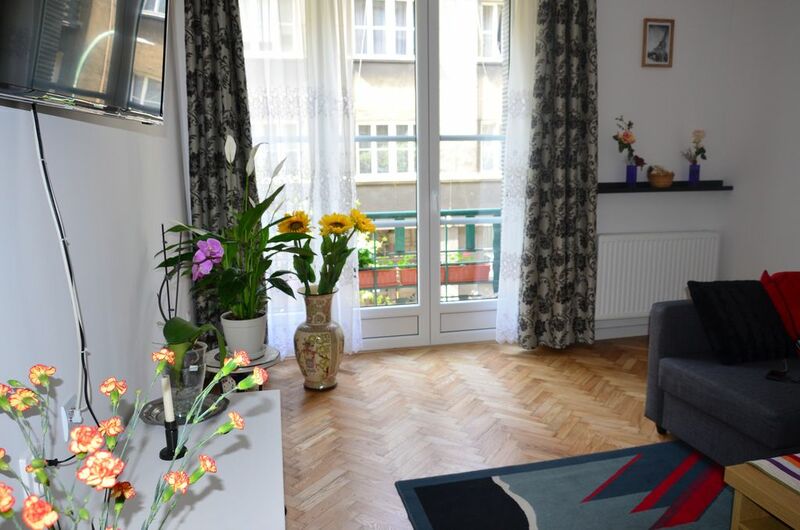 It is a large fully equipped apartment in a building built in 1930, located on the first floor in a quiet area in the historic center of Krakow .The apartment was completely renovated in early 2018. Our apartment has two bedrooms (in each bedroom there is a double bed and a single bed), the living room has two comfortable sofa-bed, which can easily be converted into extra sleeping space and very comfortable for four other person . At your disposal you have a spacious modern fully equipped kitchen (gas stove, full oven, coffee maker, electric kettle, dishwasher, toaster, microwave, cutlery, crockery etc ...) will meet the customers. more demanding. The kitchen has a balcony overlooking the garden. The white spacious bathroom with a shower cabin also equipped with a washing machine and a second separate bathroom with toilet are at your disposal. The apartment is well equipped to meet the needs of each guest. You will find 5 clean and comfortable beds to comfortably accommodate up to 8 people. The price depends on the number of people. The prices of longer stays are obviously negotiable. Excellent location next to one of Krakow's most prestigious streets within a 7-minute walk of the Old Town and the Market Square. Nearby you will find museums, galleries, churches, theaters, cinemas, entire streets lined with shops, hundreds of cafes, restaurants, pubs a short walk from the Market Square the largest and most beautiful historic square in Europe. Just around the corner you have the tram stop from where you can reach any part of the city, including the train and bus station. Its excellent location means that the apartment is an ideal base for those wishing to visit the city on foot as well as those looking for nightlife in the city that never sleeps. I can help you organize the tours for Salt Mine or Auschwitz. I can arrange a transfer from / to the airport. Accueil très agréable et convivial ..en français. L'appartement est très bien équipé, joli et agréable. Rien n'y manque et il est fort bien situé car proche du centre (15 min à pied).